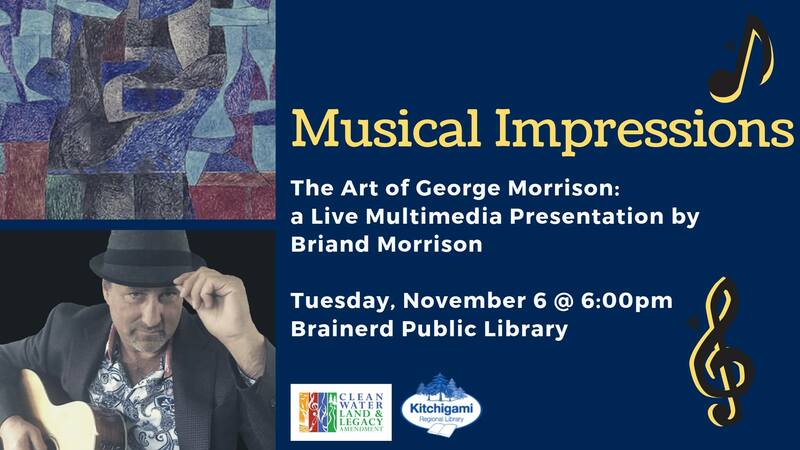 The Brainerd Public Library will host guitarist and songwriter Briand Morrison Tuesday, November 6, at 6 p.m. for “Musical Impressions: The Art of George Morrison.” Briand has composed music to accompany his father’s art. The multimedia performance is a visual sequence of George Morrison images accompanied by original jazz guitar compositions (as seen on the Blu-ray disc “Musical Impressions”). No registration necessary, all are welcome. This program has been financed in whole or part with funds provided by the State of Minnesota from the Arts and Cultural Heritage Fund through Kitchigami Regional Library.